Students in the Long Beach Unified School District signed up for a record 13,252 Advanced Placement college-level exams this spring, an 82.4 percent increase in four years. The one-year increase was 27 percent. The significant increase comes after concerted efforts to boost access to AP courses and tests. The school district is providing students greater access to AP exams by covering much of the cost for families. AP exams usually cost $92 each, but students here are paying only $5 per exam for an unlimited number of exams. For each exam, students deposit $15 and receive a $10 rebate once the exam is taken. This means that a student who takes five AP exams pays $25 instead of $460. The nearly $1 million in funding to cover the exam costs is made possible through the state’s Local Control Funding Formula, or LCFF, proposed by California Gov. Jerry Brown and approved by the state Legislature in 2013. The LCFF provides greater flexibility as to how certain state funds are used by local schools. The school district has further enhanced its college prep efforts this year by paying for the PSAT exam for all eighth through tenth graders, and by paying for the SAT exam for all eleventh graders. PSAT scores are used to generate an “AP Potential” calculation that helps students and parents to explore AP courses they might not otherwise have considered. High schools have added dozens of new AP class sections over the past two years. Local high schools also are providing additional SAT prep this year in the form of free online Khan Academy tutorials tailored to students’ specific needs, and a series of free Saturday prep sessions offering each student 33 hours of support that would otherwise cost as much as $1,000 if purchased from a private provider. 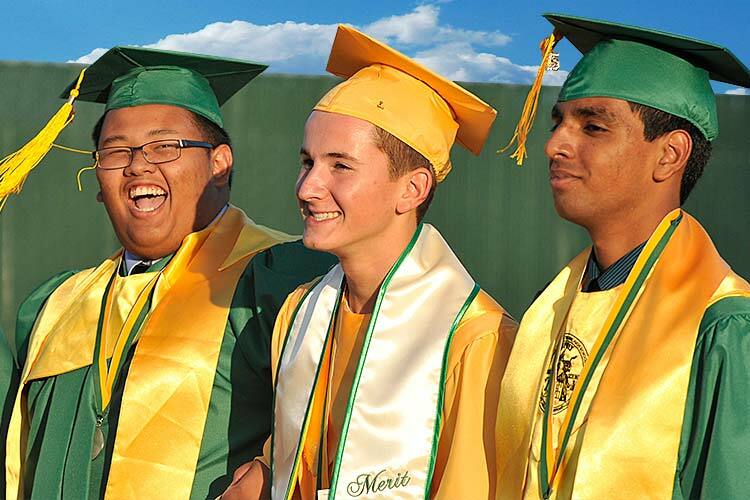 READY FOR COLLEGE – Members of the Poly High School Class of 2015 wear Advanced Placement regalia at graduation.